The latest version of the IT Governance Infrastructure, Strategy, and Charter Template now includes full job descriptions for the Chief Information Officer, Chief Information Officer (small enterprise), Chief Digital Officer and the Digital Brand Manager. 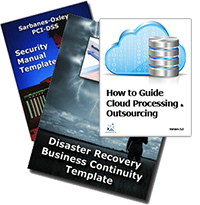 In addition, it is provided in three formats: MS WORD, pdf, and ePub (eReader). IT Governance Infrastructure, Strategy, and Charter Template - With the explosion of technology into every facet of the day-to-day business environment there is a need to define an effective infrastructure to support operating environment; have a strategy for the deployment and technology; and clearly define responsibilities and accountabilities for the use and application of technology. In most industries today, CEOs need a CIO who can be a true business partner, someone who can not only drive out costs from day-to-day operations, but strategically manage IT to enhance revenue and profits. If the CIO is stuck in tunnel vision they may be scrambling to buy and implement one application after another and execute on programs and projects without a clear sense of strategic priorities; wasting resources on applications and projects that are redundant; and carefully depreciating hardware to keep the accountants happy. The IT environment is too complex to rely on outmoded ways to keep the business functioning and thriving flawlessly. To balance the many crucial and changing enterprise demands to move the organization forward, an IT governance process is required. This increases risks in expectations of IT --- the growth of the Internet, compliance concerns, mobile computing and advanced security risks - as reasons for the critical need for IT governance. Instituting a governance process can serve as a catalyst that can effectively bring together the dynamics of cross-enterprise communication and summarize key, relevant data to provide critical metrics to make informed decisions. Prioritize your resources with a prescriptive too-set that lets you focus your efforts. Implementing a cost effective IT Infrastructure that aligns with your organization's business strategy is essential to ensuring the success of the Information Technology function. For many IT professionals, the amount of time it takes to develop and implement such a infrastructure, and the unknown process required to complete it, makes infrastructure design and implementation a daunting task. 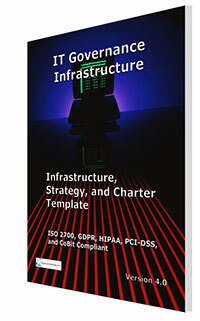 The IT Governance Infrastructure, Strategy, and Charter Template draws on the experiences of some of the best IT and business operations executives in the industry to provide you with the right shortcuts. Market and technology dynamics require that companies successfully anticipate the pendulum that swings between cost reduction to resource productivity and innovation. The transition from economic contraction to stabilization, recovery and growth will change the enterprise's strategic outlook, presenting tough decisions and new opportunities. As the pendulum swings back towards innovation, the CIO must become a visionary portfolio manager who skillfully controls three major asset classes: applications, intellectual capital, and financial capital. Managing this portfolio properly will transform IT into a streamlined revenue and profit center. The size of enterprise impacts the cost of IT as percentage of revenue is greatest in small enterprise (less than $100 million in revenue) and lest in large enterprises, those with revenues over $1 billion. Also infrastructure and budget vary by industry. The template comes as both a WORD document utilizing a CSS style sheet that is easily modifiable. Included with the template are a HIPAA Audit Program Guide and an ISO 27001 and ISO 27002 Security Process Audit Checklist. 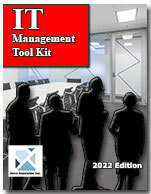 The Template is over 130 pages in length (the full table of contents can be downloaded by clicking on the link above). Also included are all of the information, forms, and policies in the Internet, PDA, SmartPhone and PC Workstation HandiGuide™ which was obsoleted in November of 2018.